Kidney stone is a chronic metabolic disease that caused by many factors, especially by the metabolic disturbances of urine compositions, but the metabolic profiling of the urine from kidney stone patients remains poorly explored. 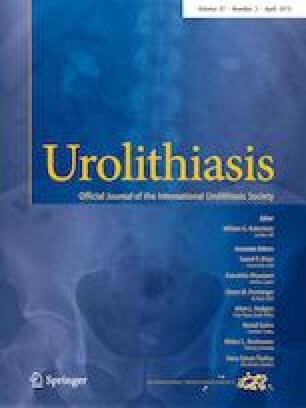 In the present study, 1H NMR spectroscopy and multivariate pattern recognition analytical techniques were combined to explore the metabolic profiling of the urine from kidney stone patients. A total of 216 urine samples obtained from kidney stone patients (n = 110) and healthy controls (n = 106) were investigated. The results indicated that principal component analysis (PCA) and partial least-squares discriminant analysis (PLS-DA) models were capable of distinguishing kidney stone patients from healthy controls. In addition, a total of 15 metabolites was obviously different in concentration between the two groups. Furthermore, four metabolic pathways, including glyoxylate and dicarboxylate metabolism, glycine, serine and threonine metabolism, phenylalanine metabolism and citrate cycle (TCA cycle), were closely associated with kidney stone. Together, our results established a preliminary metabolic profiling of the urine from kidney stone patients via using 1H NMR-based analytical techniques for the first time and provided a novel method for recognizing and observing the kidney stone disease. Xiaolu Duan and Tao Zhang contributed equally to this work. The online version of this article ( https://doi.org/10.1007/s00240-019-01132-2) contains supplementary material, which is available to authorized users. This study was financed by Grants from the Guangzhou Science Technology and Innovation Commission (No. 201704020193, No. 201607010162 and No. 201604020001), the National Natural Science Foundation of China (No. 81670643, No. 81601273 and No. 81870483), the Collaborative Innovation Project of Guangzhou Education Bureau (No. 1201620011) and the Science and Technology Planning Project of Guangdong Province (No. 2017B030314108). All procedures performed in the present study involving human participants were in accordance with the ethical standards of the Ethics Committee of the First Affiliated Hospital of Guangzhou Medical University and with the 1964 Helsinki declaration and its later amendments or comparable ethical standards.